Dedication: As I wrap up this final Bird of Christmas on Epiphany, my mother turns 80 today. She has been teaching me to appreciate birds for almost 47 years; I dedicate this entire series to her. It was my first time exploring the Monteverde Cloud Forest Reserve, a deep green magical forest with tall old-growth trees that seem to be from another place and time. Hiking along lush trails through mist that evaporates as sunlight streams down from the canopy, I was mesmerized by an eerie yet lovely soundtrack of high pitched “eeenk” sounds followed by what can only be described as a “metallic bonk,” like the amplified plunk of an out-of-tune piano key. 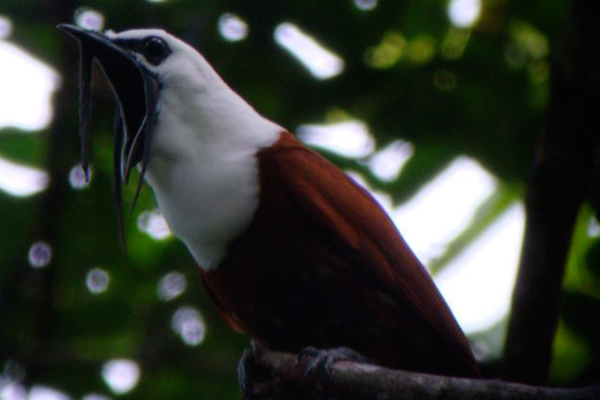 Following the “eeenk; bonk” sounds from one opening in the thick tropical forest to another, I finally spotted the enthusiastic vocalist, a male Three-Wattled Bellbird! He is a beautiful creature with a ghostly white head, neck and shoulders, and a chestnut-brown torso, perched on the very tip of a craggy branch, not too high up in the trees, mouth gaping open to project his territorial call for up to two miles! Watch him making his call and you will want to go! 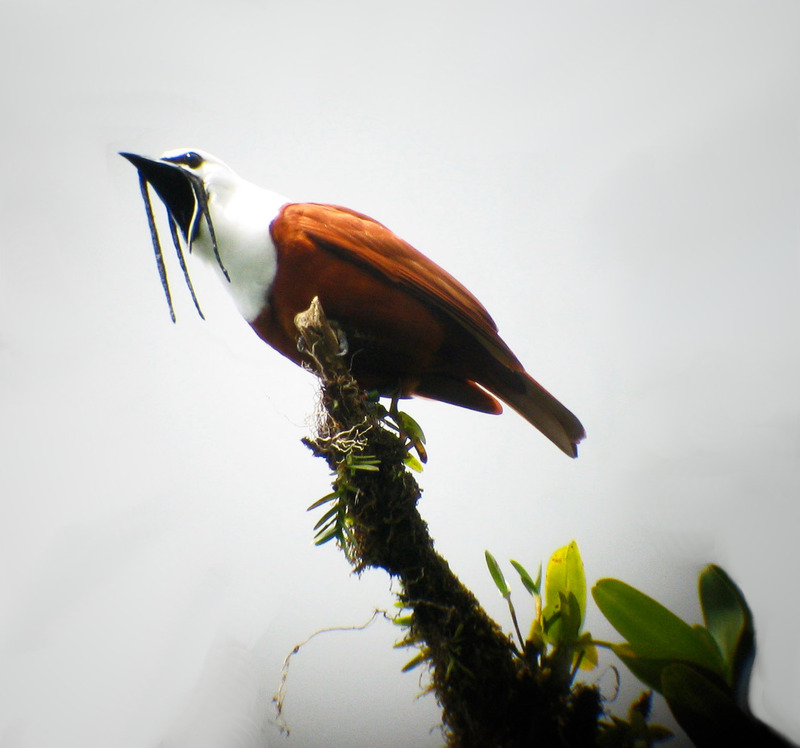 A couple of nights before, I had visited La Calandria Private Reserve and Lodge, where I heard a presentation by Debra Hamilton about the Three-Wattled Bellbird, Procnias tricarunculata. Debra is a conservation biologist, a mom, a bird research specialist, owner and manager of a small bookstore and café, the director of the Costa Rican Conservation Foundation – and those are just a few of her titles. 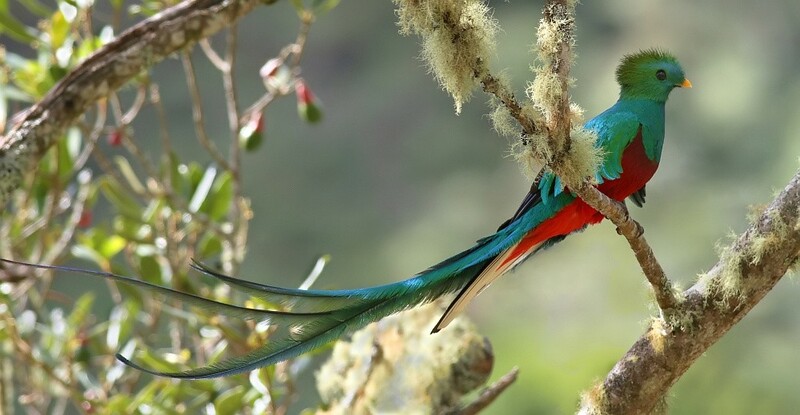 She has devoted her life to studying the rare and endangered bird species that make the mystical Monteverde Cloud Forest their home, and is heading up many projects to help save these hauntingly beautiful birds. 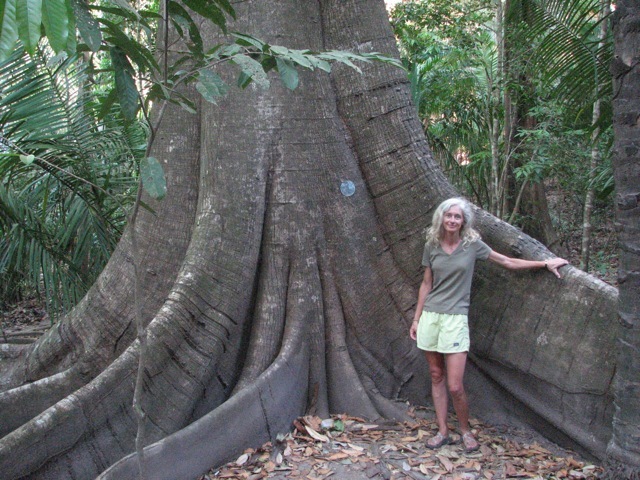 Debra, who has been working in the Monteverde area since 1992, explained that there are only a few Bellbirds still in existence in the very special humid forest habitats where their favorite food, the wild avocado, grows. This is because, sadly, much of the tropical forest containing the bird’s food supply has been cut down, in Costa Rica and in other Central American countries. What was once a large area of forest is now only in small fragmented pieces. Along with several other scientists, Debra has studied diversity of understory birds and the use of agricultural windbreaks as biological corridors for birds moving between forest fragments. She is currently involved in a long-term study of the Bellbird, including investigations of migratory patterns, population locations and sizes (which means taking a Bellbird census! ), and the possible impact of climate change on Bellbird populations. Debra and her colleagues know that in order to save the Bellbird from extinction, its remaining habitat must be preserved and protected. So they have begun to focus much of their energy on reforestation projects. I want to help, and so does Terra Incognita Ecotours, so we plan to partner to offer a special bird conservation trip this spring. 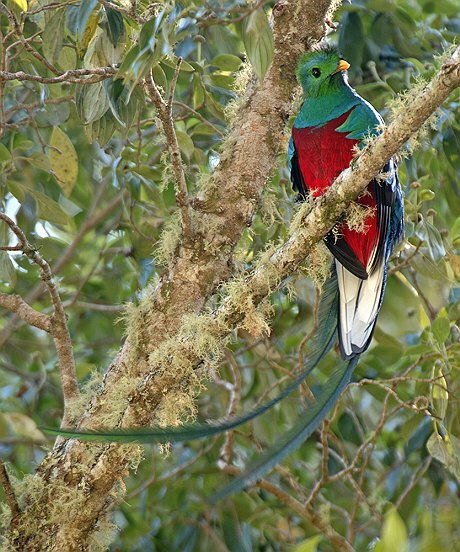 I’d like to hear from anyone who would be interested in a voluntourism experience in May or June 2011 staying in Monteverde at La Calandria Private Reserve and Lodge and visiting the Monteverde Cloud Forest Reserve. You would join us in planting trees that will help expand and enrich habitat for the Bellbirds (and other avian species such as yesterday’s Resplendent Quetzal) so that their voices will always ring out over the cloud forest canopy. Read more about the bellbird and Debra Hamilton here. Some photos for this entry are courtesy of Lapa Rios Ecolodge in Costa Rica and Bruce Smith of Seascape Kayak Tours. Today’s and tomorrow’s birds are ones I’ve never seen, but intend to go on a quest for during my next excursion to Costa Rica. 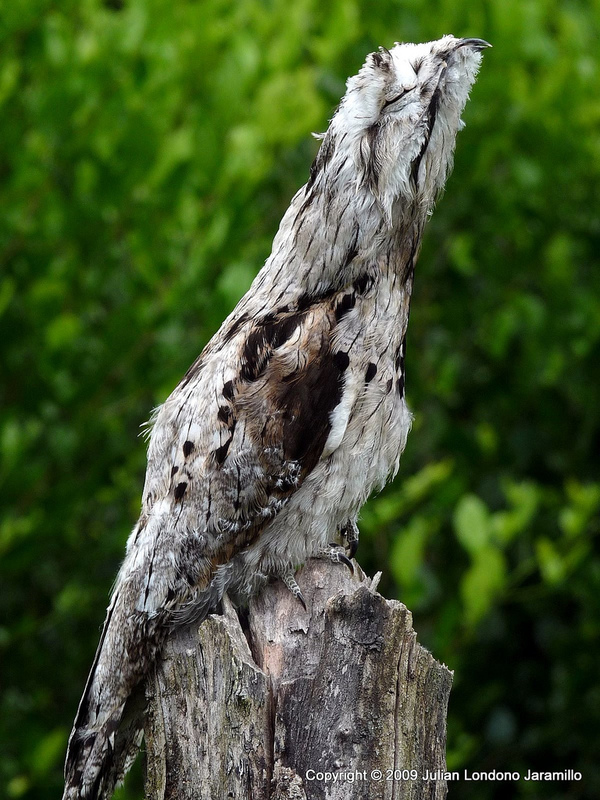 First is the Potoo, a very well camouflaged type of nightjar that comes in three species: Great, Northern and Common. I don’t care which one I see, I just want to see one. These rarely-seen-but-often-heard nocturnal birds belong to the family Nyctibiidae, which only occurs in the New World tropics. The Common Potoo and Northern Potoo are virtually identical, while the Great is much larger. During the day, these birds’ cryptic plumage and signature stretched-out pose makes them difficult to distinguish from the broken-branch stubs and posts on which they typically roost, their mottled feathers blending in perfectly with their woody perch. At night, when they are active hunters and open their huge eyes, they can be mistaken for owls. They sally out in the dark to catch large flying insects – and in the case of the Great Potoo even small bats – with their large gaping mouths open wide. The Great’s eerie deep roaring GWAAAAAA while perched, and the higher pitched and more emphatic GWOK emitted in flight, are described as otherworldly. A professional photographer I know is currently in Manuel Antonio and is headed for Corcovado National Park on the Osa Peninsula in a few days, either place in which he might be able to spot and take some images of a Potoo. If he picks up this gauntlet and is successful, we’ll provide an addendum blog of his photos here. Meanwhile I include a shot of the Great Potoo by Ged Caddick of Terra Incognita Ecotours taken in Brazil’s Pantanal and a nice Common in Costa Rica by Julian Londono Jaramillo. Here is a nice little intro to the Potoo by David Attenborough, again in Brazil. 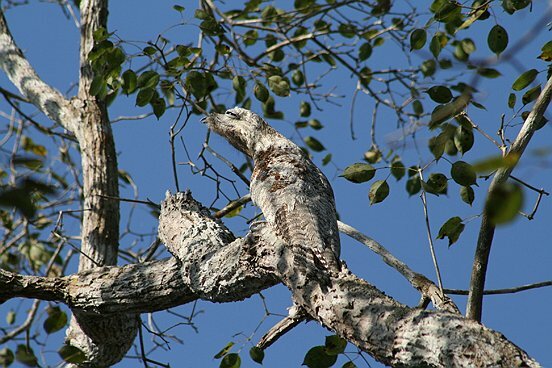 Constantly while I was in Costa Rica, I believed every post and branch would end in a camouflaged Potoo – I really tried. Who wants to go Potoo hunting with me this spring? Let’s do this! 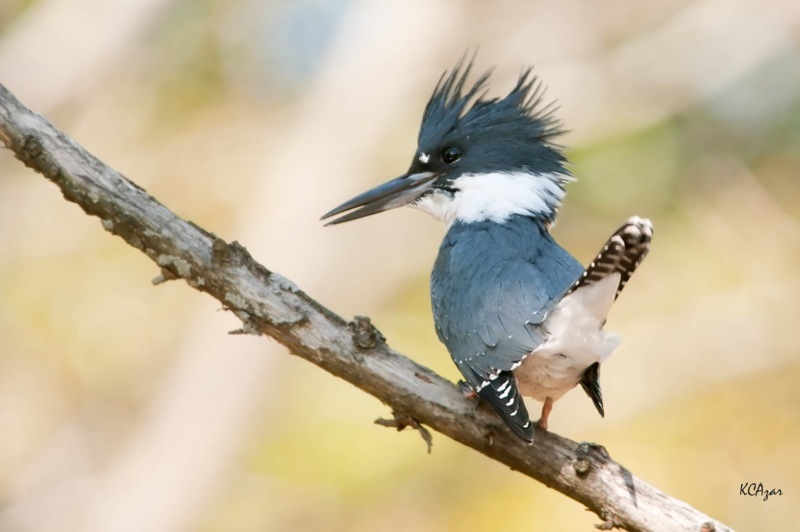 For the 9th bird, we return to the water for a large, conspicuous and common waterside resident of Canada and North, Central and South America, the Belted Kingfisher (Megaceryle alcyon), whose portrait can actually be found on the 1986 series Canadian $5 note. 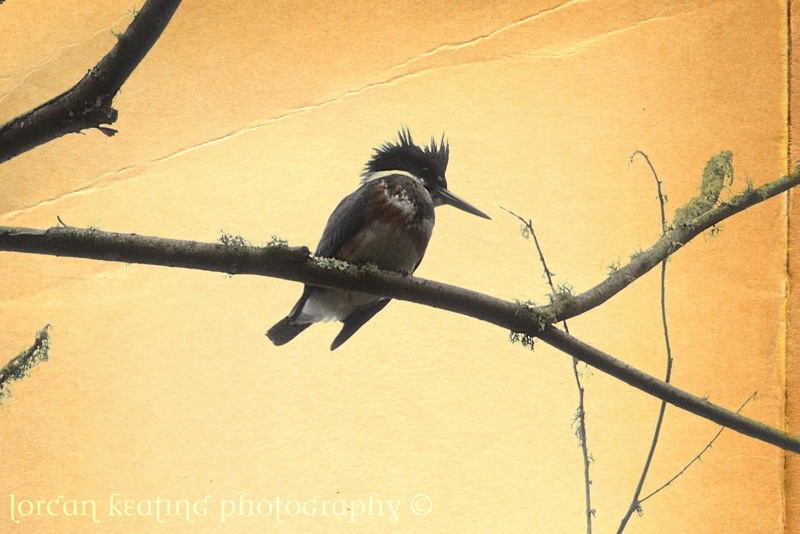 Often while paddling on the Rio Panica or hiking near the estuary in Curú, I would see one of these amazing huge-headed kingfishers, one of five types seen in Costa Rica, the others being the Ringed, Amazon, Green and American Pigmy. 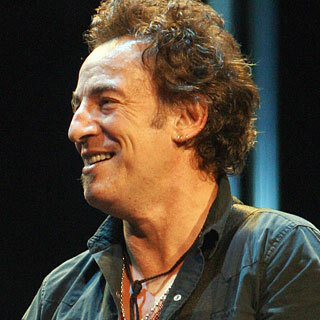 Often times I would hear the bird before seeing it, as it was smashing a small fish upon a branch, “whack, whack, whack,” turning it’s great bill to and fro to alternate sides and ensure the life was completely drained from the prey before devouring it, its Mohawk crest flopping about like the shaggy mop of a rock star. I’d also hear its “keck keck keck” sound as it few off a few hundred yards ahead and perched somewhere in search of more prey. Watching it dive head-first straight down into the water is exhilarating, especially if it resurfaces with a fish. An example of reverse sexual dimorphism, the female kingfisher’s rust stripe makes her more brightly colored than the male. All kingfishers were formerly placed in one family, Alcedinidae, but recent research suggests that this should be divided into three. 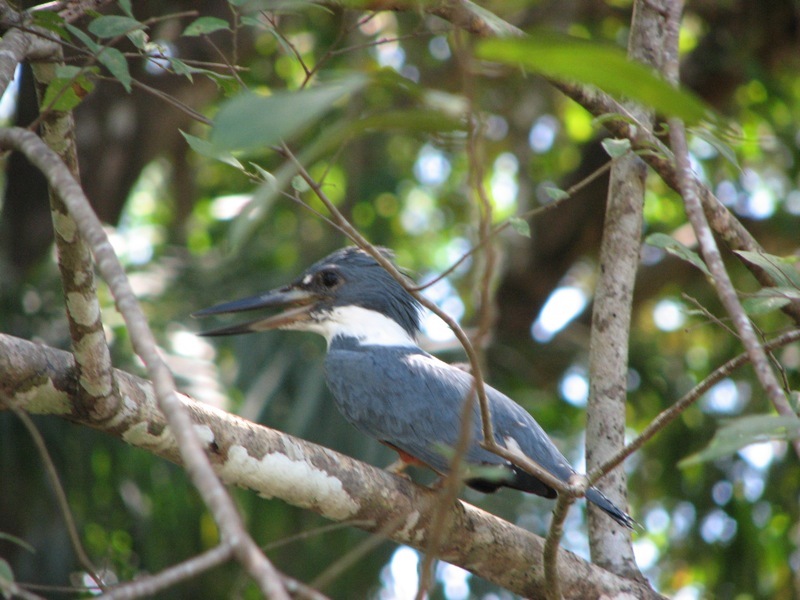 All six American kingfishers, together with three Old World species, make up the new family Cerylidae. The nest of the belted kingfisher is a long tunnel that slopes uphill in case of flooding so the chicks will be able to survive in the air pocket formed by the elevated end of the tunnel. Not being a photographer, I never captured great photos of the bird (I include only one of mine), but feature it here in the new year because of its association with peace in literature. The halcyon bird is also a mighty wanderer: it migrates from the northern parts of its range in Canada to the southern United States, Mexico, Central America, the West Indies and northern South America in winter. Sometimes straying far from land, the species is recorded as an accidental visitor on oceanic islands such as Clarion (700 km from the Mexican mainland), and has been spotted as an extremely rare vagrant in Iceland, Ireland and the United Kingdom. Enjoy some good footage of the Halcyon Bird. The Belted Kingfisher beats a large fish on a rock. To herald the new year, I’m choosing a forceful bird of prey, one that I’ve seen a handful of times, always at a fairly great distance, and so even with my zoom, I never got a respectable shot of my own. 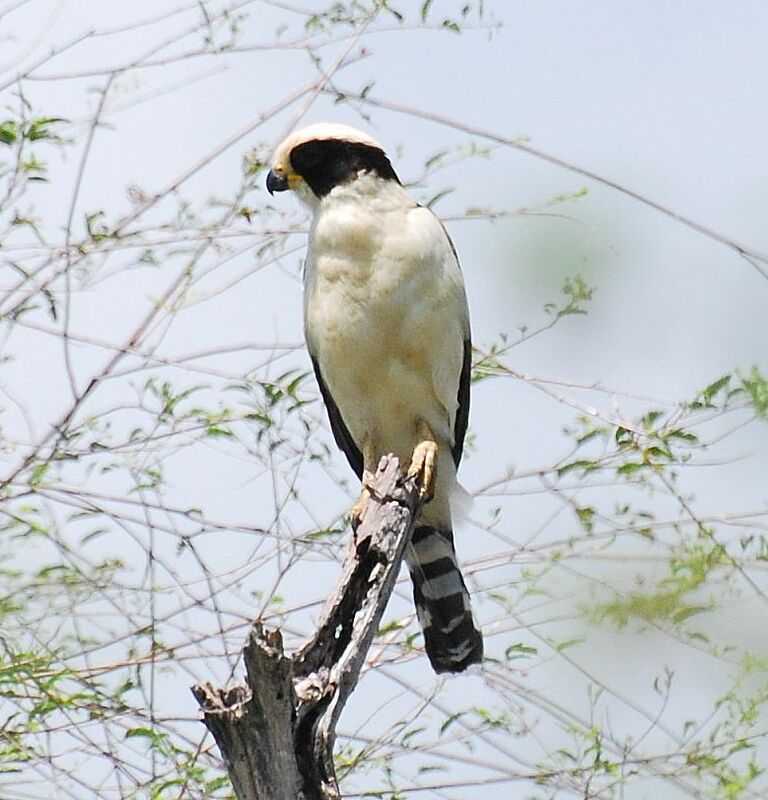 The Laughing Falcon, Herpetotheres cachinnans, named for the peal of laughing notes that initiate its lengthy song, is a large white raptor with a striking dark mask and is usually seen perched on a high tree branch in an open area, scanning the ground below for its preferred prey, snakes. After nipping off the snake’s head, it sometimes swallows the entire body as if it were a string of spaghetti. This bird – known locally as the Guaco, an excellent paraphrase of its most common call – apparently has some immunity to snake venom. If you like this sort of writing, check out Skutch’s works. Hear the call of the Guaco. 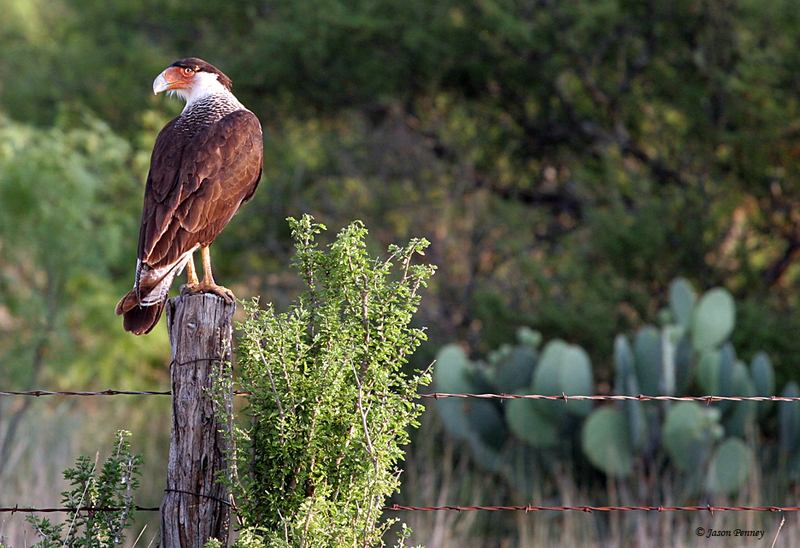 Watch a video showing the Laughing Falcon. I mentioned in yesterday’s entry that my favorite color is yellow. 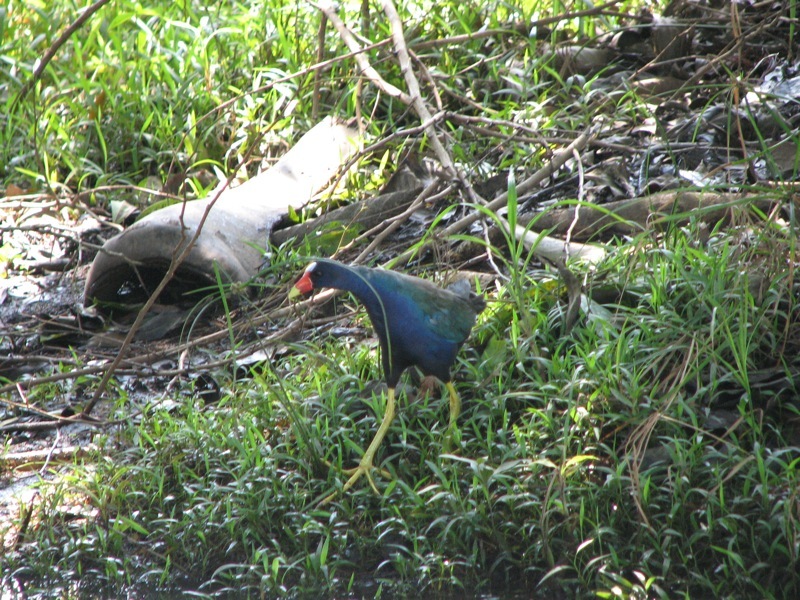 Well, my second favorite color is purple… and another of my favorite water birds found in Costa Rica is the American Purple Gallinule (Porphyrio martinica). 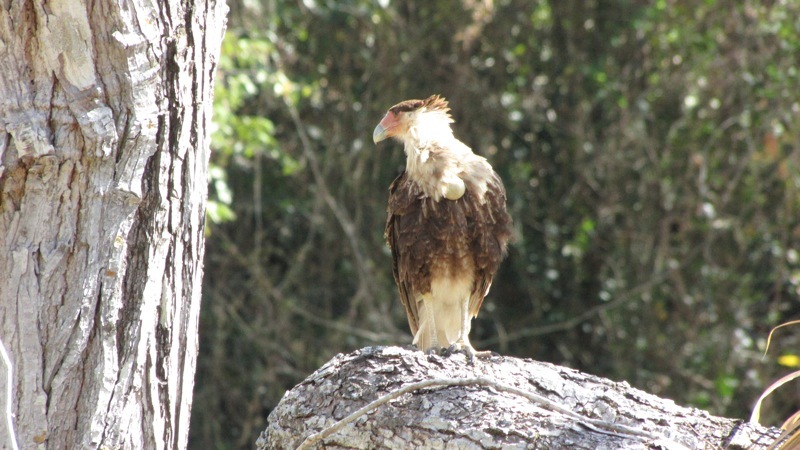 Unlike most of the birds in this series, this bird can also be found in the southeastern US, which is where I had an endearing experience that won me over as a fan for life. Gallinules – or “swamp hens” as they are often colloquially called – are in the rail family Rallidae, and although they are almost always on the water, will rarely swim at all. They rather scramble awkwardly through thickets and tall reeds, walk on floating mats of vegetation, and will only fly short distances, somewhat weakly, with legs dangling below them. They are extremely vocal, making loud screeches, and harsh reedy peeps. During a February in the early 2000s, my best friend from childhood and I were staying for a week at a little fishing village situated on a small lake in central Florida. We’d hike around the margins of the local marsh area every day to spot alligators, lizards and of course whatever bird life we could see. 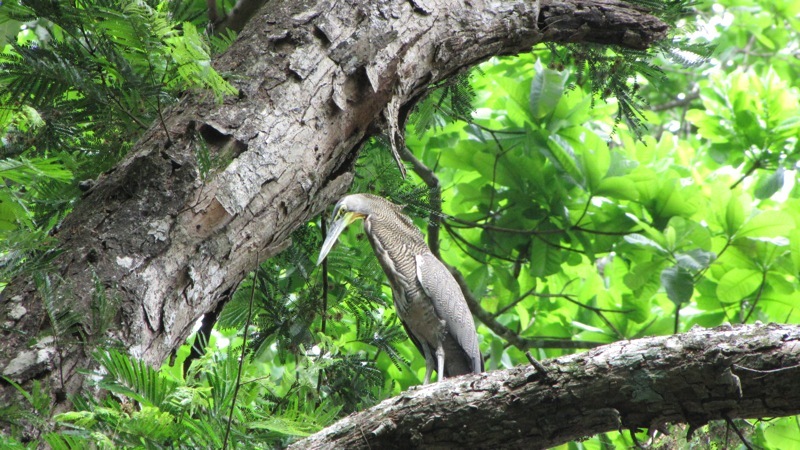 Living amid the usual egrets, herons and sandpipers, there was a noisy colony of iridescent medium-sized chicken-like birds, who had huge yellow feet, purple-blue plumage with a green back, and a red-and-yellow bill and white undertail. The coolest part of their appearance was a pale blue forehead shield, which looked like it had literally been painted onto the bird by some crazed artist. It soon became apparent that each duck-like individual had a slightly different look, hue or size of this frontal shield by which you could recognize him or her. 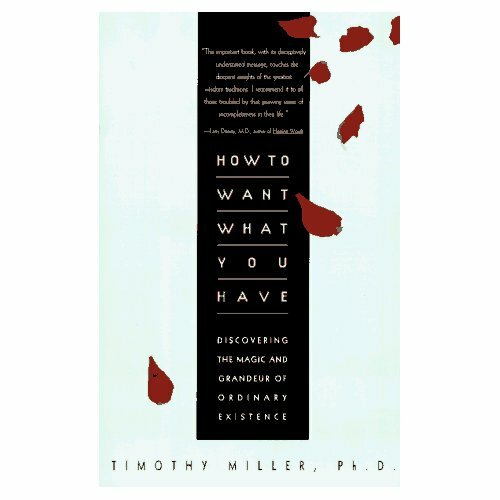 One of the sad results of the adaptation of wild creatures to places frequented by large groups of human beings is that certain individual animals are especially susceptible to becoming “tame” and they consequently become dependent upon people for their food – and show no fear of them. In the case of this group of gallinules, while most of the colony remained skittish upon our approach, scuttling away on little lily pads almost as if able to walk on water, one little buddy always remained quite close and would eat morsels of food right from our hands. He also called to us with an endearing “pip pip pip PEEEEEEEEEER!” We referred to this vocalization as “piping” and never forgot our little friend. 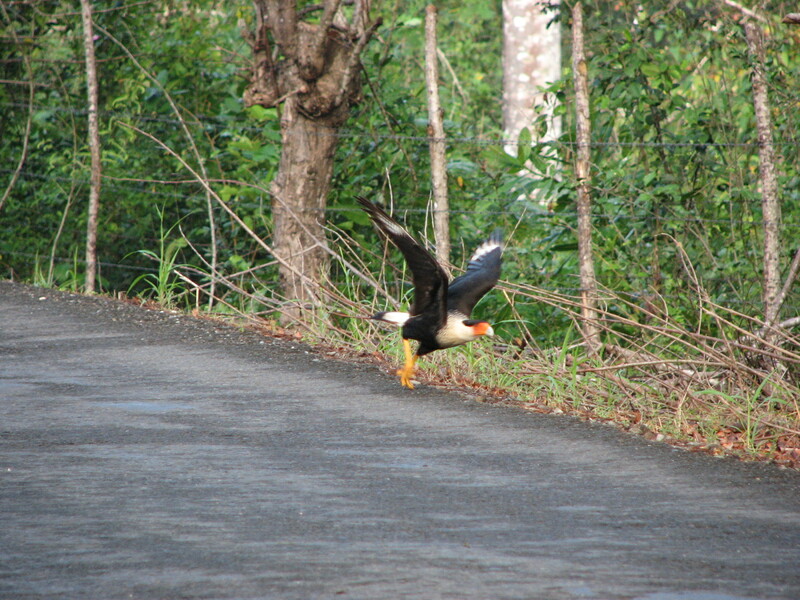 In fact, when I returned to the camp a year later, I was able to locate him again! 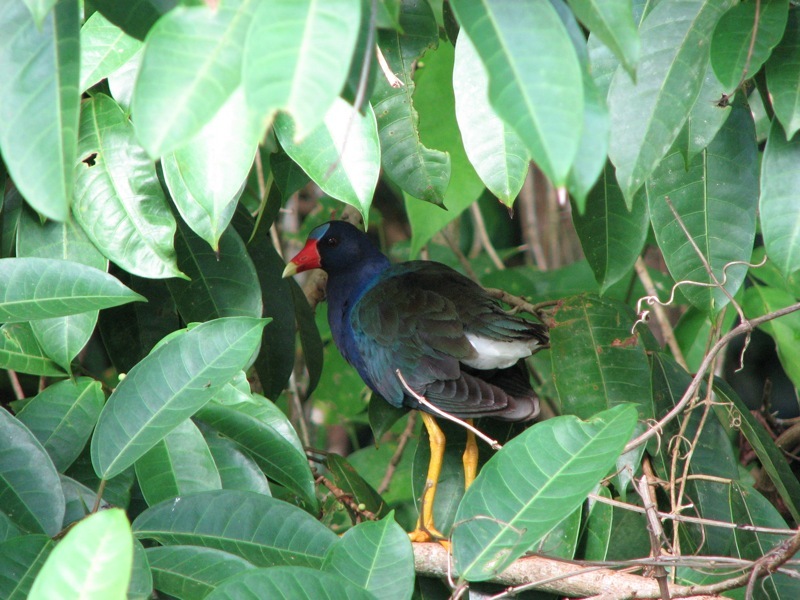 So, when on the Caribbean coast of Costa Rica, in Tortuguero National Park, I was always elated to find my familiar Gallinule friends, although none was ever so charming or friendly as the piping gallinule of Leesburg, Florida. Just for an interesting comparison, I include below a photo of the Northern Jacana, a bird that appears very similar to the Gallinule, and has a yellow frontal shield. 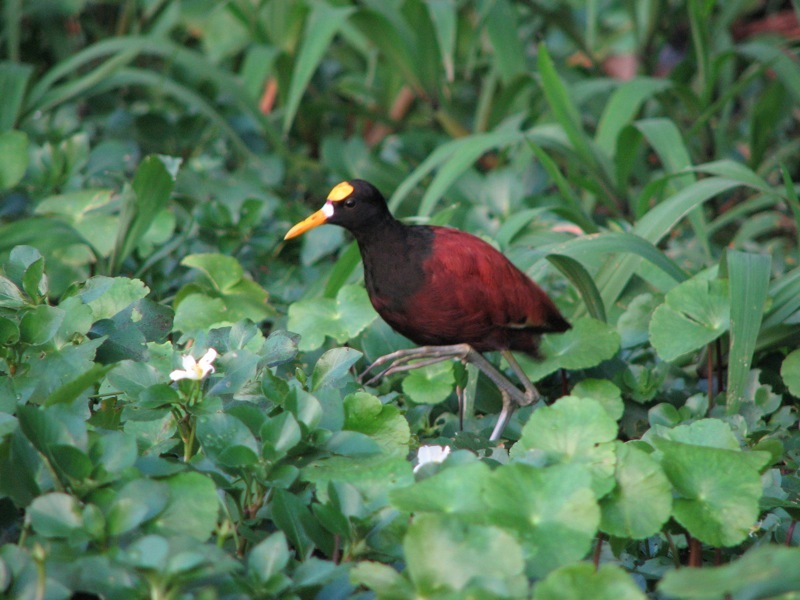 Like the Gallinule, the Jacana lives in marshes, ponds and other wetland ecosystems. Not considered to be globally threatened, Purple Gallinule populations are probably decreasing in their range due to freshwater wetland loss in the United States, and in South and Central America. Sadly, these birds have been destroyed in rice fields by aerial spraying with pesticides. 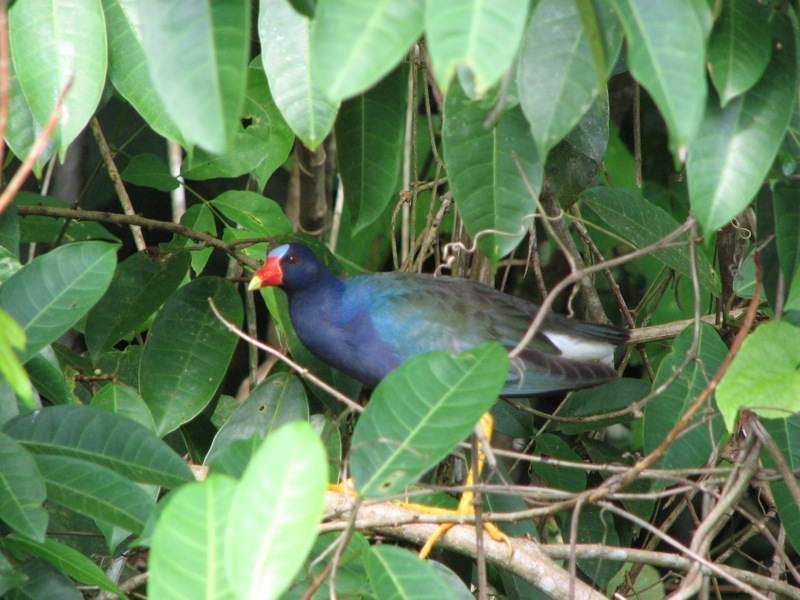 Hear the vocalizations of the Purple Gallinule. 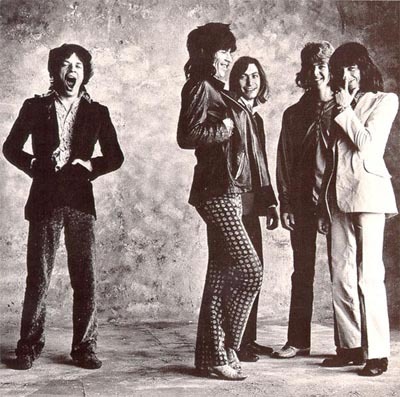 Photos in this entry by Frances Figart and Bruce Smith. 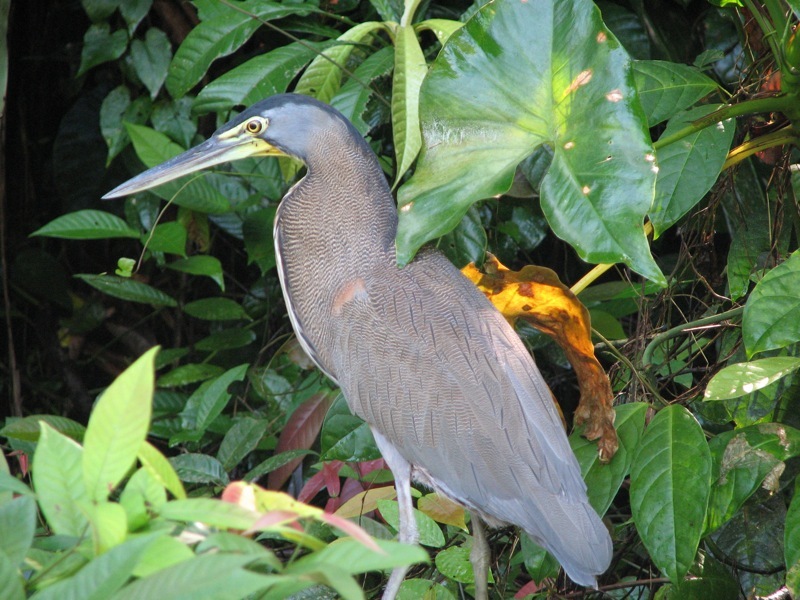 As we continue exploring bird species found in Costa Rica, it’s time to look to the estuaries, lagoons and other waterways for our next two days’ subjects. Sometimes late at night on the Nicoya Peninsula, I heard a howl that didn’t sound like a howler monkey. It sounded more like a wild cat – and I envisioned the unlikely jaguar or puma nearby. If I hiked very early in the morning on the Finca de Monos trail that wound along a tiny creek in Curú Wildlife Refuge, I could tread very lightly up a little hill on the trail, not making a sound, and upon cresting the rise, peek down over the steep bank of a the little waterway, and thus sneak up on a solitary long-legged fishing bird, waiting motionless for a fish, frog or crab to come within reach of its long bill. 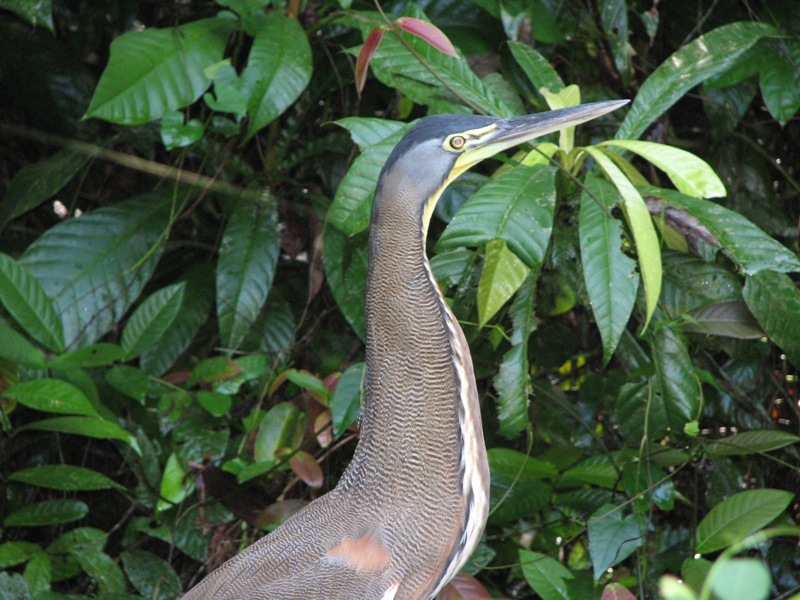 The strangely cat-like cry I had sometimes heard in the night belonged to this estuary ecosystem dweller, the Bare-throated Tiger Heron. Tigrisoma mexicanum is a wading bird of the heron family Ardeidae, found from Mexico to South America; it is said there was an accidental who appeared in Hidalgo County, Texas once. 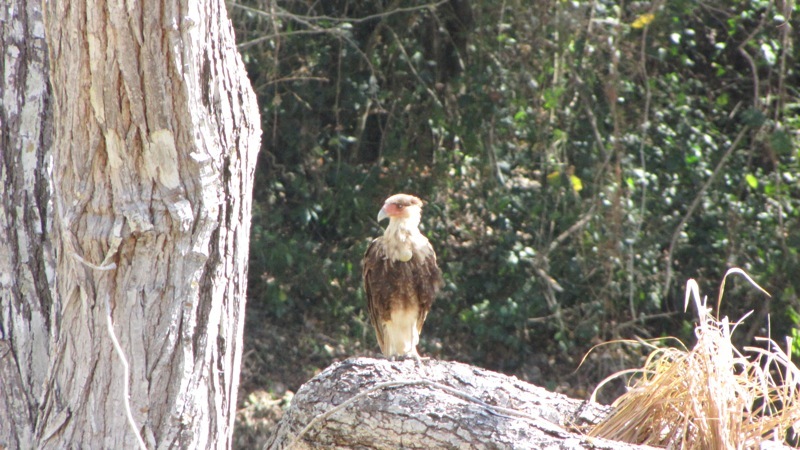 At times I would come upon this shy bird while paddling along the Rio Panica, or when visiting a remote watering hole in a mountain stream with a waterfall. Since flying isn’t this heavy bird’s strong suit, it’s not too hard to photograph; it usually remains perched yet wary rather than expend the energy to retreat. My favorite color is yellow and my name rhymes with “tiger.” So of all the herons, this bird is my favorite for its lovely tiger stripes and beautiful yellow neck, which it magically extends whist offering up its hoarse “howk-howk-howk,” making itself look unnaturally elongated. When the male emits his creature-from-the-black-lagoon night call, the beak opens wide and, if you were there watching, you’d be able to see his saffron throat actually vibrate with the sound. At other times it shrinks its neck down into its shoulders to appear very short. 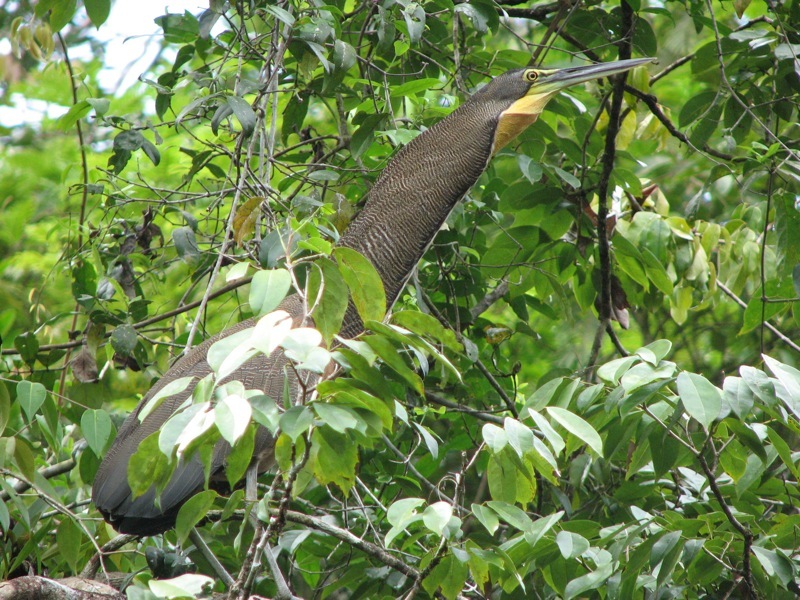 And speaking of short, click here to hear a brief NPR article about some guys who heard a Tiger Heron while sitting around their campfire in Guatemala – the bird’s call is included on the tape. 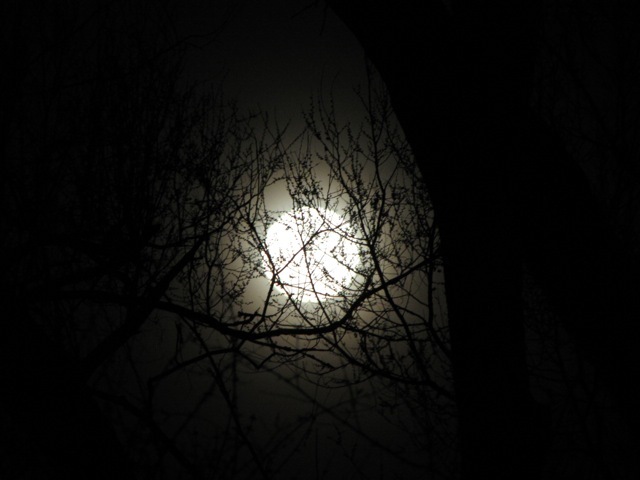 Photos for this entry are by Bruce Smith and Frances Figart (rhymes with Tiger). Image courtesy of Paulo Philippidis from San Jose California, USA via Wikimedia Commons. As if this crazy motion were not enough, what’s really incredible about Psarocolius Montezuma is the call the dominant male makes when he’s doing his acrobatic bowing display, sort of a bubbling warble with loud gurgles that climaxes in a shrill scream. 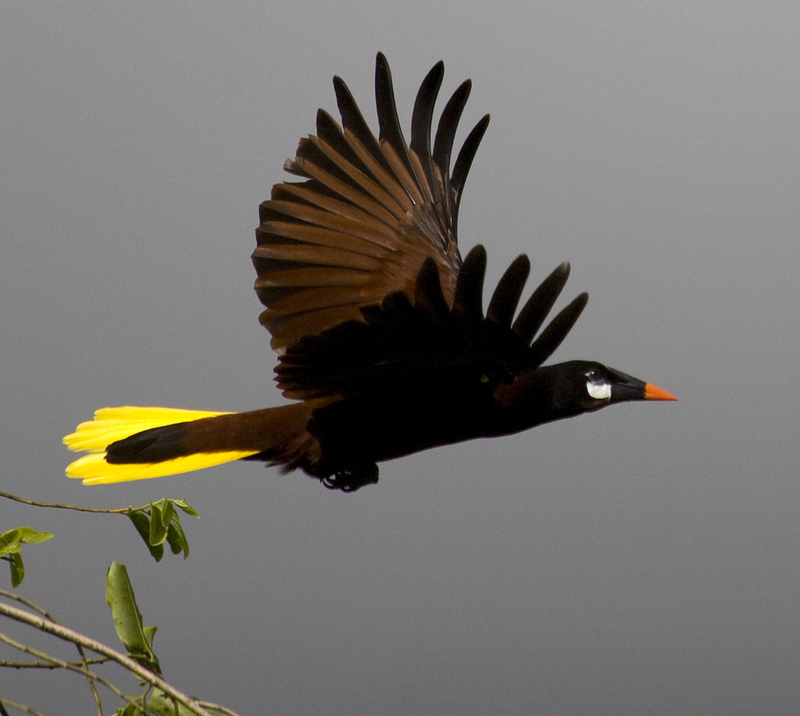 It’s indescribable, but here’s the bird experts’ attempt: “The strange and remarkable song of the Montezuma Oropendola is an ascending series of overlapping bubbly syllables which crescendo to a high peak. The song is often accompanied by a scratchy call that is reminiscent of a fizzling firecracker or the ripping of a thick fabric (Stiles & Skutch 1989).” This bird wins my prize for the most amazing call I have ever heard. I think it would be virtually impossible for a human to emulate it. These birds are colonial breeders. 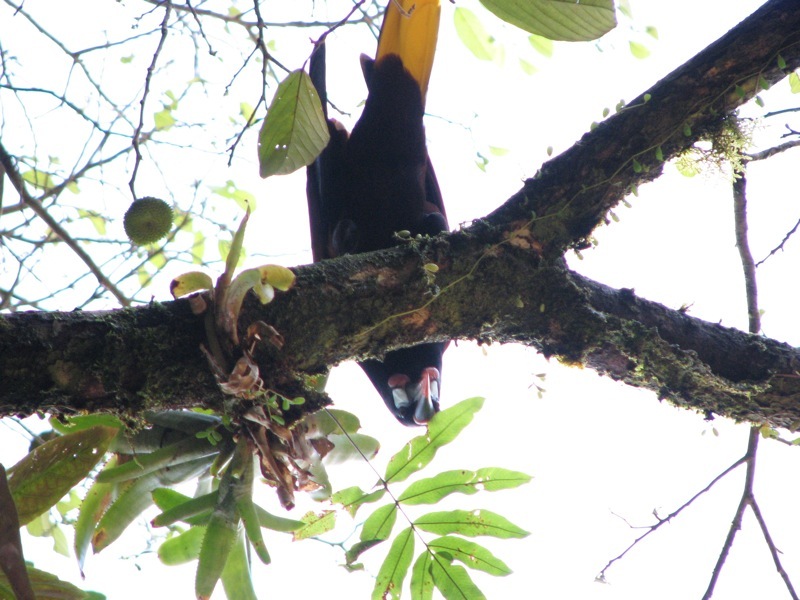 Using fibers and vines, the female Oropendola creates a bag-like nest 2-6 feet long that hangs from the end of a tree branch; they like to place many nests together on the same tree. 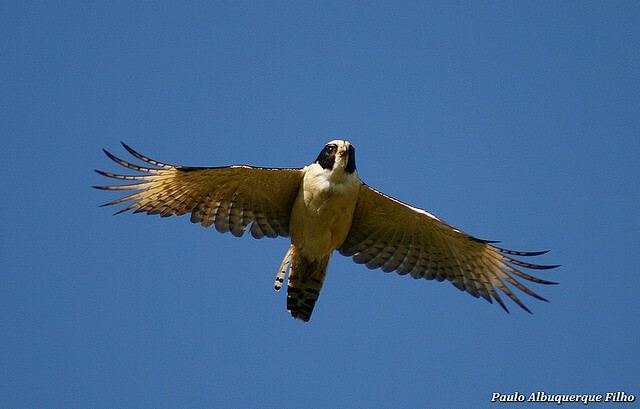 There are generally about 30 nests in a colony, but up to 172 have been recorded. 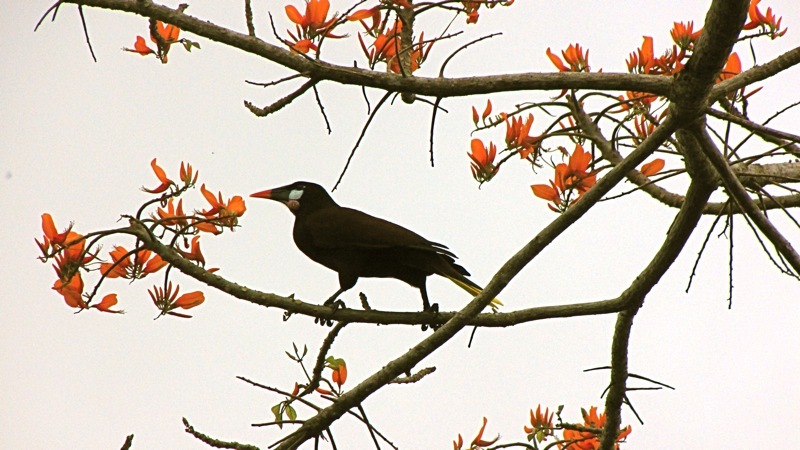 The more nests on the same branch, the more risky the baby Oropendola rearing becomes because the entire colony could come crashing down from the weight. Scientists suspect the nest clusters allow the females to more easily protect each other’s nurseries and to gang up on visiting predators. This video provides a great feel for what it sounds like to be in their presence, and shows you the pendulum-like nests made by the females. 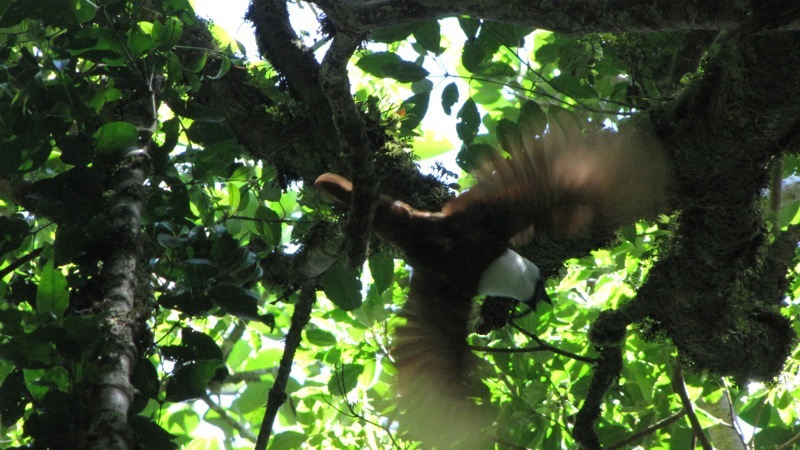 Here is another video that demonstrates the acrobatics of the male. 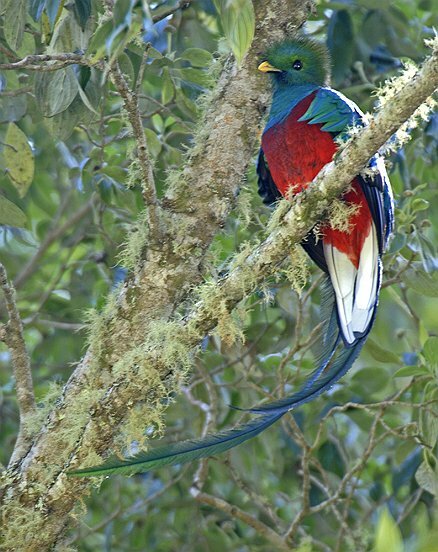 I got to see this bird a handful of times, mostly up in the mountains near the Turrialba Volcano, but never got excellent photographs – so I share only one of mine above. I know that my next trip to Costa Rica will be planned to include some time in the Caribbean lowlands where I can see and hear these amazing birds – and shoot some videos of them.